"Metal Head", oil, collage, mixed media on canvas, 60 x 82", 2014. "I Love Your Hair", oil and collage on canvas, 60 x 72", 2013. "Sting", oil on canvas, 36 x 48", 2013. "Headdress", oil on canvas, 24 x 36", 2012. "Raw Potential (Slugger)" (detail), oil, mixed media on canvas, 36 x 48, 2012. "Progressive Youth #1" , 76 x 60, oil, mixed media on canvas, 2011-12. Okamura – a recipient of the 2004 Fellowship in Painting from the New York Foundation for the Arts – has exhibited extensively in galleries throughout the world, including the U.S., Canada, Italy, Japan, Ecuador and Turkey, and has been selected nine times to appear in the prestigious BP Portrait Award Exhibition at the National Portrait Gallery in London, England. In 2006, Okamura was short-listed by the Royal Surveyor of the Queen’s Picture Collection for a commissioned portrait of the Queen of England. Tim Okamura’s art is on display in the permanent collections of the Davis Museum at Wellesley College, The Alberta Foundation for the Arts, the Toronto Congress Center, the Hotel Arts in Calgary, Canada, and Standard Chartered Bank in London, England. Celebrity collectors include Uma Thurman, musicians John Mellencamp, Ahmir “Questlove” Thompson (The Roots), director Ben Younger, as well as actors Bryan Greenberg, Vanessa Marcil, Annabella Sciorra, and Ethan Hawke. "The Lioness", 66 x48", oil, mixed media on canvas, 2005. "Little Sister", 64 x 86", oil on canvas, 2011. — withBeverley Francis. 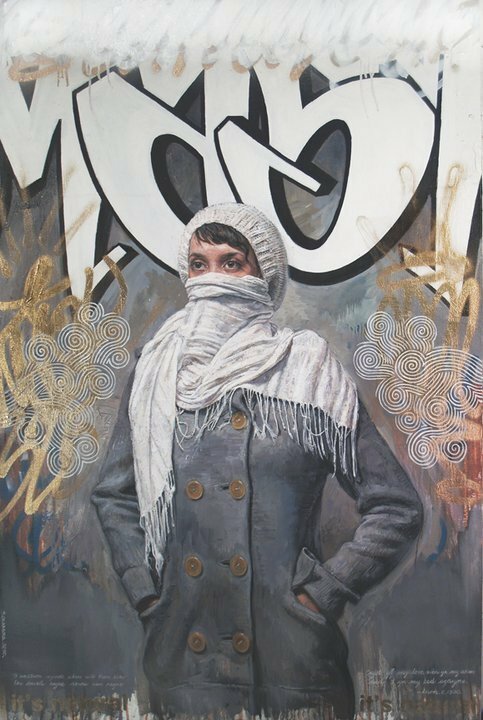 "North Wind / White hood" oil, gold aerosol on canvas, 24 x 24", 2010. "Winter's Night", 24 x 36", oil on linen, 2010.